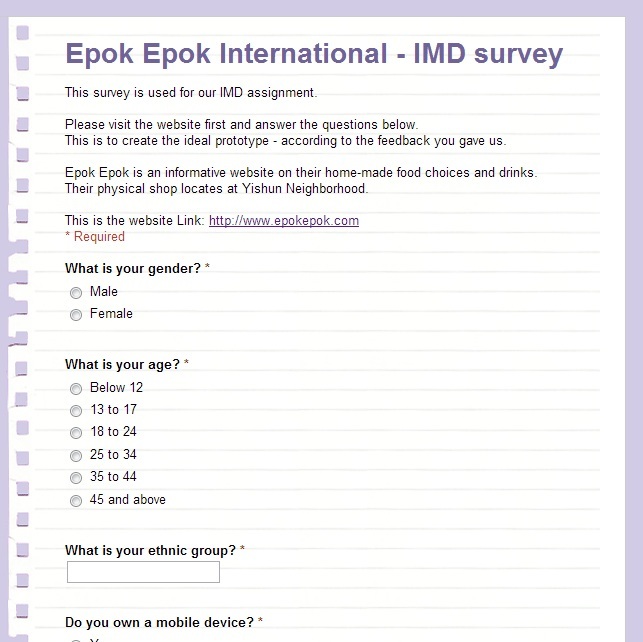 Can you help me / us to do a survey? When people saw or heard the word "survey", they will pretend that they didn't see it or they will find excuses not to do it. This is a major problem that almost every surveyor and marketers hate to do it, but they need to do it no matter what, in order to find certain statistics for their campaign (target audience) to meet their projects' objectives or for the sake of their clients / customers - sometimes to their bosses / team leaders. But for me, it's just a school assignment. 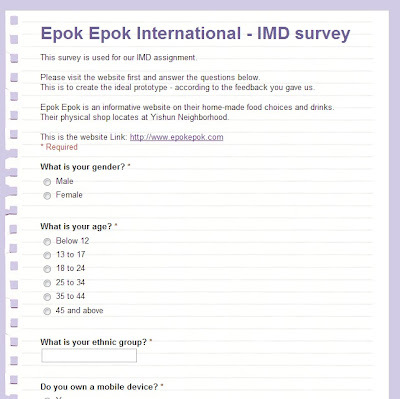 There is no profit gain / money involve for doing the survey. The only benefit that I can get is grading. Anyway, back to the topic !! This module is named as Interactive Media Development (IMD for short). I was told by my lecturer to do this project in the group of 2. So, I teamed up with Jason (if you have read my previous blog entry: Social Innovation Project, that is the Jason I'm talking about) to do this assignment together. Using the design thinking system concept, surveys are part of the project in order to define Persona Development and Customer Journey mapping. Therefore, in order to get a better grade and to absorb good learning experience, it would be better to do it as real-time instead of faking the survey result. I don't know how are the other lecturers of IMD inform their students. But for mine, she told the class to do weekly activities related to this assignment and submit small presentation to her about our progress for the project. Last week, the presentation was about website goals & objectives; company background; company competitors and survey results. Jason and I didn't have enough time to do the survey, so we told the lecturer truthfully. For this week, she told the class to submit her presentation slides about persona development and journey mapping - according to the survey results we found last week. There will be a total of 15 questions (if i counted correctly), inclusive of both open-ended and close-ended questions. Jason will be doing the persona development and journey mapping and submit to drop-box by this coming Friday. I don't know whether he can do it on time or not. It's not that I don't believe his working capabilities. It just that I learnt for last week lesson that he was unable to deliver the survey questions (only 3 questions during the lesson, right before our presentation) and results (didn't get the result - so we told the lecturer the truth) on time. Here is some background info of the website that we are going to make an improvement, using Flash. From the info I got from Jason, Epok Epok International is a F & B small and medium enterprise, locates in Yishun Neighborhood. Their products are about selling home-made food choices and drinks. They also provide delivery services. If you are free, please kindly do this survey for me and Jason.